Unlike the chap in the Dos Equis beer commercials (are those only in the U.S. and Canada? ), I am the LEAST interesting man in the world. 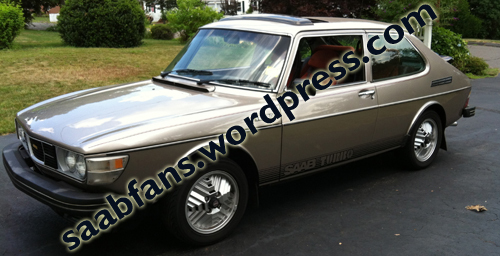 My excitement originates in a drive in a Saab, and today in particular, in our oldest, the 1978 99 Turbo. The 99 performed admirably for an old car that doesn’t get started or driven enough. However my drive reminded me of why I’d actually consider selling the 99 and even our Viggen. I’ve come to hate driving, at least where we live, and we don’t often get out to where I DO enjoy driving anymore to warrant letting these cars sit and get dusty. So even without modern creature comforts like AC on a hot summer day, the 99 was a fine and fun ride. It ate up nasty roads that haven’t been paved in far too long and ate up corners on highway that make every other car feel like it’s going to lose control… and with windows and sunroof open, AC wasn’t missed. On the subject of windows and sunroof I’ll add mentioning that the 99 is amazing at keeping air flowing around you yet still allowing the lighting of a celebratory cigar while on the highway with windows and roof open. Something about the aerodynamics of the 99 is fantastic. I recall with my 99 EMS keeping it ridiculously well waxed to the point that friends could not sit on the hood at our local beach (thankfully) and as well I didn’t need windshield wipers in a lot of rain conditions if I was moving as the rain simply blew off the waxy EMS. I even drove with windows and roof open in the rain, snow too, and again as long as you were moving you didn’t get wet unless it really rained heavily. Enough of my babbling about the 99. It was a fun day in the car in spite of traffic, road conditions, etc. I snapped a few mobile phone pics and a video after getting home while the 99 Turbo cooled down. 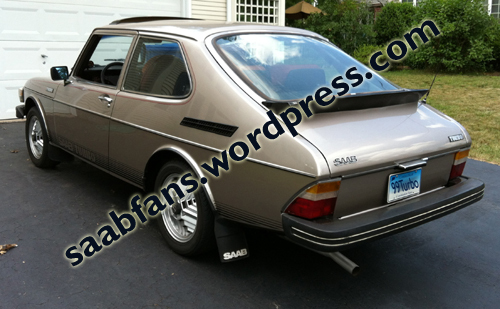 I’ve placed obnoxious “watermarks” on the photos to demonstrate how annoying I find them on other sites. How’d I do? Are they obnoxious enough? If anything in this post is interesting it may be the following. I love driving every Saab we’ve owned and think it or say it aloud after nearly EVERY drive in them. 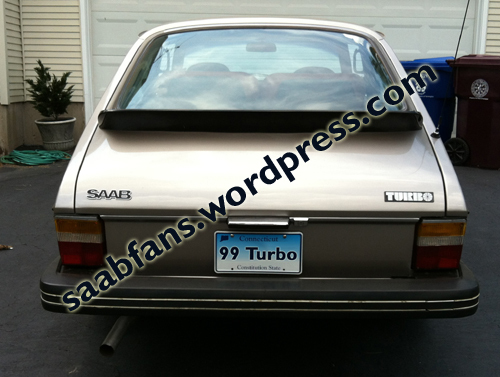 However the Viggen and 99 Turbo provide something different or more special than our other Saabs. You can see it in the video. I could not hold the camera phone still no matter what I tried. I get adrenaline shakes from the car. Not because of anything terribly exciting that happened on my ride, but because the car just makes me that excited, etc. Below are the original video and then the version that youtube offered to “fix” for me which does some weird stuff to the car and its shape. Hoping you have an equally exciting set of Saabs to enjoy wherever you may be. I’m also hoping that NEVS lets the people of Trollhattan design and build something worthy of the Saab name that I’d like to own in the future! I love everything about this car including the exhaust noise both idling and while driving. Tunnels and “Jersey barriers” which bounce the exhaust sound back at me while driving are particularly appreciated by my ears. No it doesn’t have the unique burble of a 900 Turbo but the 99 Turbo is neat. Even the electric cooling fans you hear as I shake my way around the nose of the car sound cool to me. Now that is a fantastic 900! Uber cool! !